The US Census Bureau released the 2017 Population County and Metro/Micro Area Population Estimates. Between 2016 and 2017, the Washington-Arlington-Alexandria, DC-VA-MD-WV Metropolitan Statistical Area (Hence forth, the Washington Metro Area), increased its population by 65,908 between July 1, 2016 and July 1, 2017.1 This represents an increase of 1.1 percent, and continues the trend of relatively stable regional population growth; the region grew 1.0 percent between 2014 and 2015, and 1.0 percent between 2015 and 2016. Figure 1 shows that the region declined in two of the three components of population change. The region had less natural increase and less international migration between 2016 and 2017, than it did between 2015 and 2016. 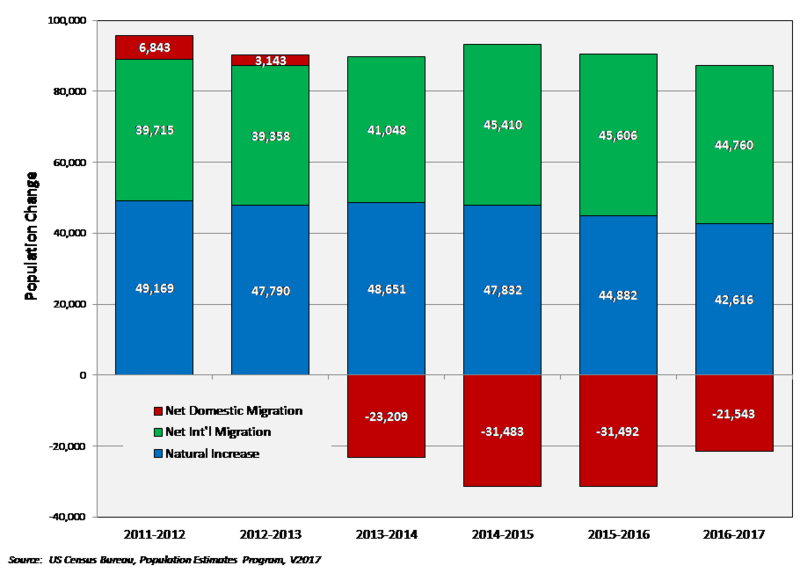 Perhaps most noteworthy for the region is the continued net domestic outmigration for the fourth consecutive year. 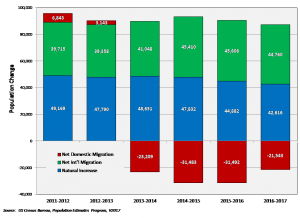 Although not as large as in previous years, over 21,000 more domestic migrants left the Washington Metro Area than moved to the area.